June 05, 2017, 12:44 p.m.
London mayor Sadiq Khan came in for criticism from US president Donald Trump on Sunday after Khan called on Londoners not to be alarmed by an increased and armed police presence that day following the terror attack on London Bridge. Taking the Mayor’s comments out of context, Trump tweeted “At least 7 dead and 48 wounded in terror attack and Mayor of London says there is "no reason to be alarmed!" 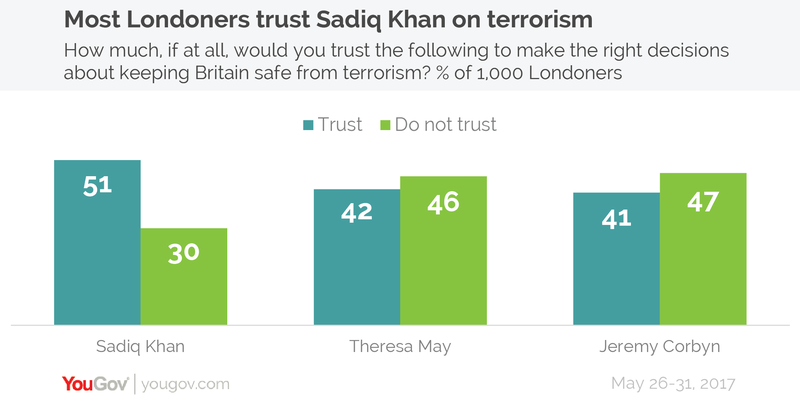 Despite the US president’s suggestions to the contrary, a YouGov survey conducted last week found that the majority of Londoners (51%) trust Khan to make the right decisions about keeping Britain safe from terrorism. Only three in ten Londoners (30%) say they don’t trust the Mayor of London to make the right call on terrorism. In fact, Londoners trust their mayor more than they trust Theresa May and Jeremy Corbyn to make the right call on terrorism. Both the Prime Minister and Leader of the Opposition are less trusted than trusted on this topic. While 42% trust May and 41% trust Corbyn, 46% don’t trust the Prime Minister and 47% don not trust the Labour leader. This is not the first time YouGov has found Londoners backing their mayor on the subject of terrorism. In response to an attack in New York last year, Londoners supported Khan by 69% to 22% in the face of media criticism when he said that being prepared for terror attacks are “part and parcel” of living in a big city. Nor is this the only occasion where Trump and Khan have clashed. In response to previous criticism from the Mayor that the president’s views on Islam were ignorant, Trump challenged Khan to an IQ test. A subsequent YouGov survey found that British people expect that the Mayor would have beat Trump handily in such a test. Using a scoring system that based on the responses given by the public, giving incrementally lower multipliers for &apos;far above average&apos;, &apos;slightly above average&apos;, &apos;average&apos; and so on, Sadiq Khan scored 67.9 compared to Trump’s 45.1.